Went to the Royal Albert Hall last night for a Christmas carol singalong! It's a hoot. I'm not religious but it's very "Christmassy" and good fun. 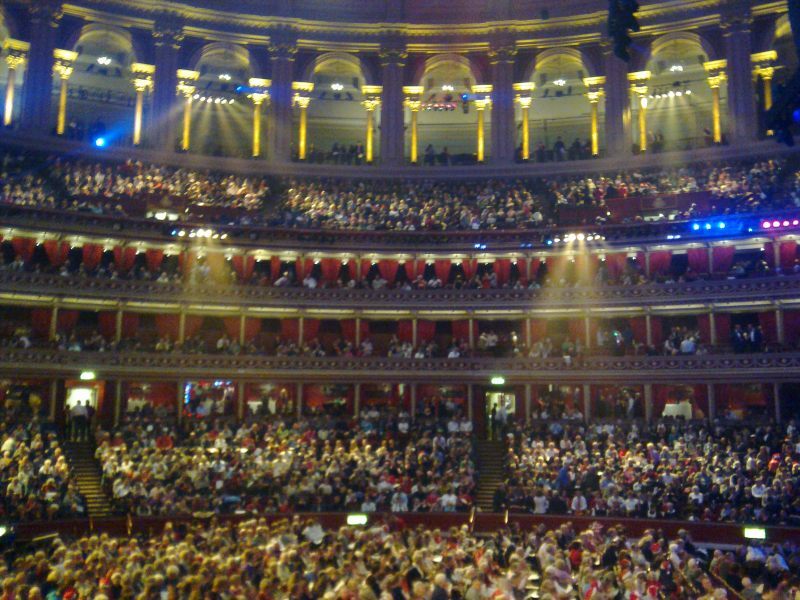 There's not many people can say they have sung at the Albert Hall! For me, it's as much about the venue, it's a beautiful hall, takes your breath away when you walk in. I took the picture from my seat in the stalls. 11am. Okay, it's tiny flakes but it's still snow! White Christmas? 3pm. Flakes are getting bigger and it's lying in places! 7pm. Snow has gone, just wet and miserable now! The fair is in town! 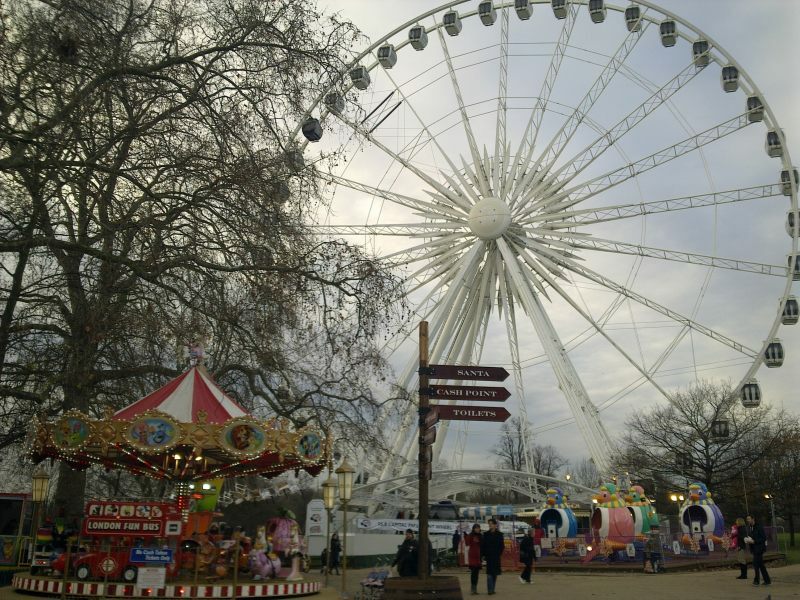 Well, in Hyde Park at any rate! 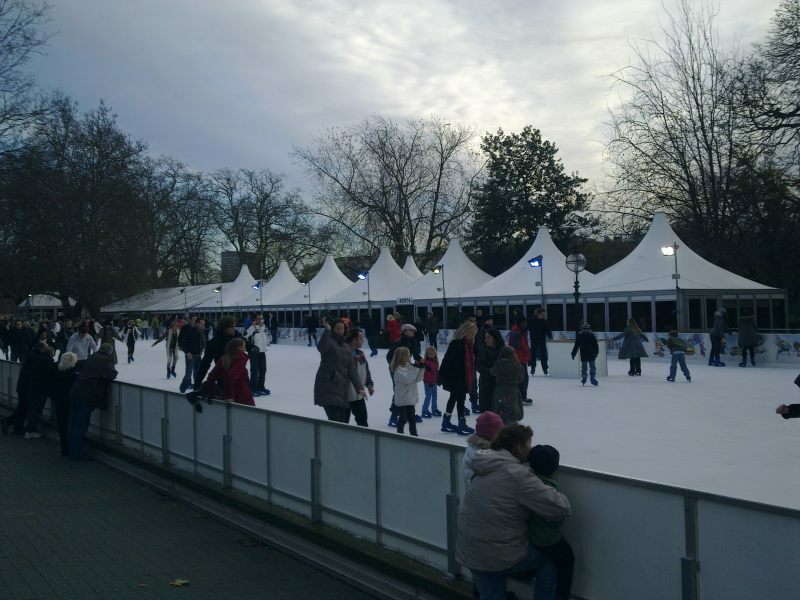 They've got lots of stalls and rides, and an ice rink too. Very festive! If you plan to visit, try to avoid busy times, evenings/weekends. 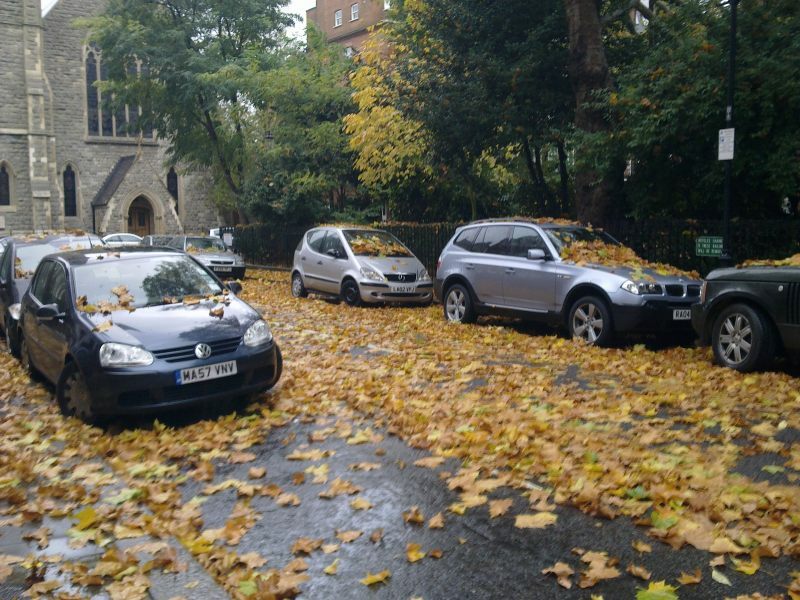 I got stuck in the middle of it last year when taking a "short cut" through the park! Most of the attractions are either-side of the road, and it gets jammed solid when it's busy...not fun! 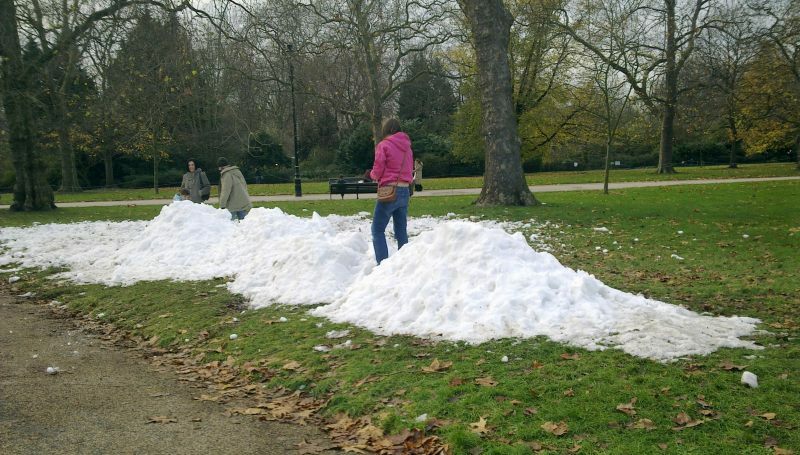 Here's a pile of snow in Hyde Park. Only thing is...it hasn't been snowing! I presume it was left over from some event or other. It's real snow alright, the sort you get in indoor skiing centres. As a skier I was delighted to see it and had to have a stamp on it to feel the consistency! It's been pretty cold the past couple of days, which has helped preserve it. 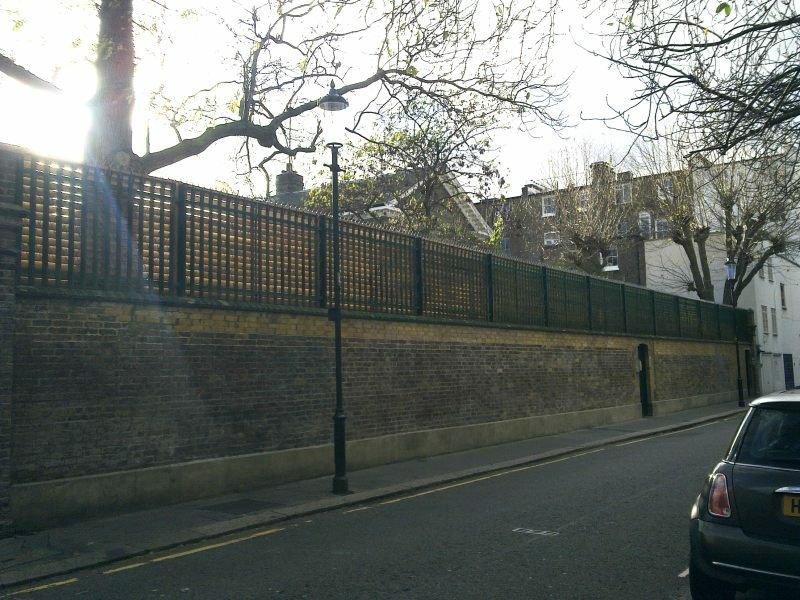 I recently discovered that Freddie Mercury's house was in Kensington, not too far from me. Took a walk out to see it today. 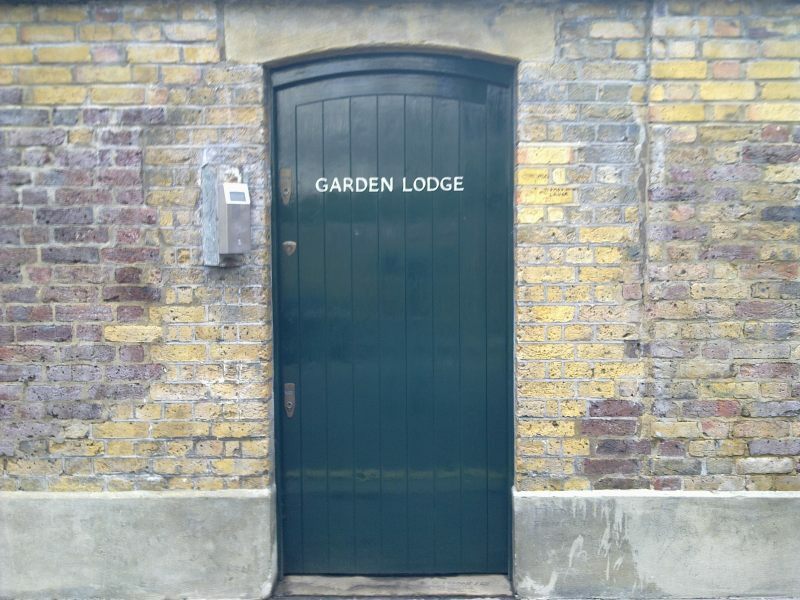 It's at 1 Logan Place and is called the Garden Lodge. He lived here from 1980 until his death in 1991 (he died in the house). In his last years he spent most of his time here. When he died, this place became a site of pilgrimage, still is to a point. Fans left a lot of messages and graffiti on the door and the wall (you can see pictures of it from the links below). It was cleaned up in recent years. The door looks like it was painted very recently, and there is hardly any graffiti on the door or walls (there is a little bit but you can't really see it in these pictures). I think that's a bit disrespectful to the current owner (Mary Austin, Freddie's one-time partner and lifelong soulmate) when you can clearly see that some work has been done to make it clean and presentable. I'm not what you would call a huge Queen fan, but like most people I think they are pretty good and Bohemian Rhapsody was about the best pop/rock song ever written! 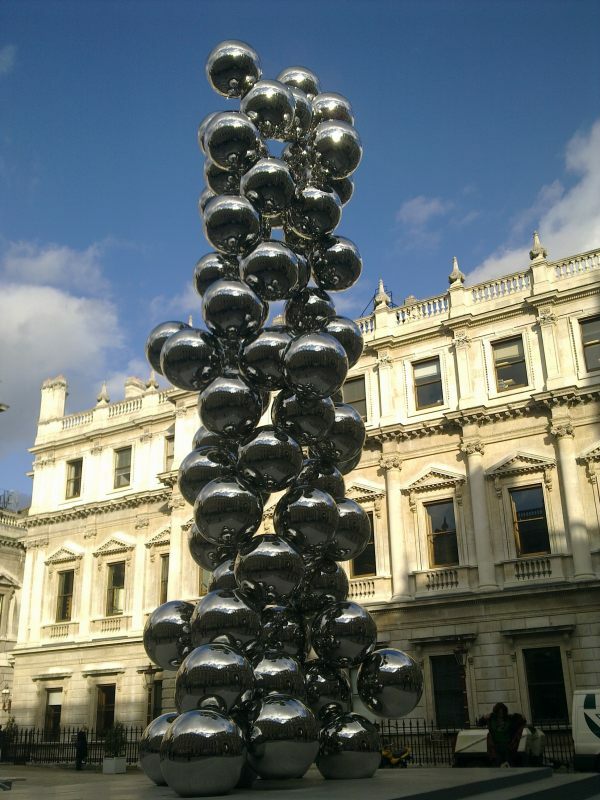 The Royal Academy of Arts, Piccadilly, are currently exhibiting work by the sculptor Anish Kapoor, including this spectacular sculpture in the courtyard. 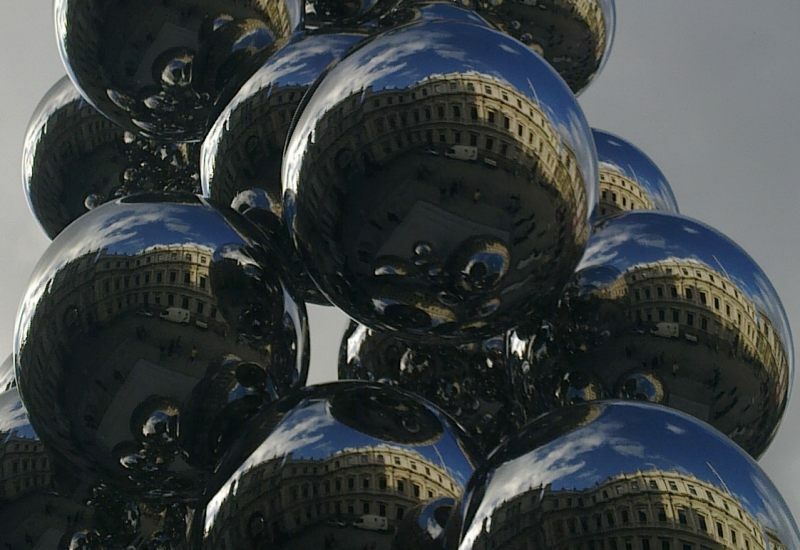 It's a bunch of chrome balls stuck together with "no visible means of support". Actually, they are mirror-polished stainless steel, but look like chrome! It's a lovely thing, and very well made, you can't see the joins or how the balls are held together. 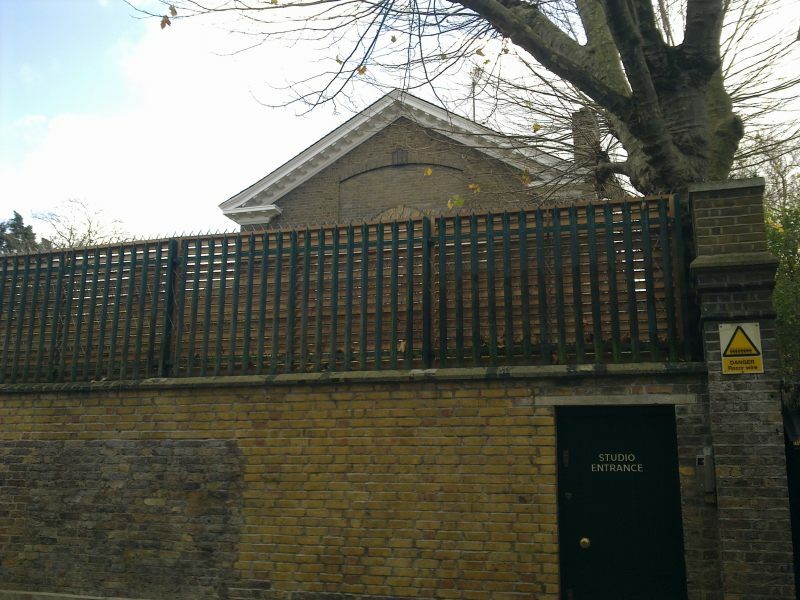 According to the RA website, this sculpture "both disorientates and distorts, challenging our traditional notion of form and space". Personally I didn't feel challenged when I viewed it, just thought it was a handsome piece of work! 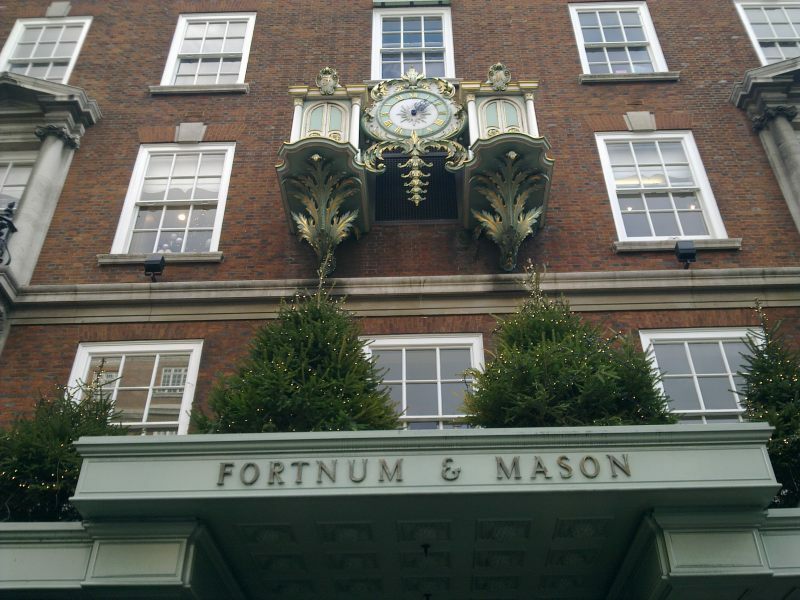 Fortnum & Mason is a posh grub shop that has been on Piccadilly since 1707. They specialise in hampers and have got a good range for Christmas. You can even order them online. Check out their website below. Passed the shop today and noticed they had their Christmas trees up. Good to see them using traditional Norway Spruce trees. The picture shows the trees above the front door, beneath the famous clock (it chimes and little figures come out). Every time I see the store, I am reminded of the scene in the movie Darling, where Julie Christie (Darling) and her pal go into Fortnum & Mason for a shoplifting spree! Decided against trying that today (honest Guv)! 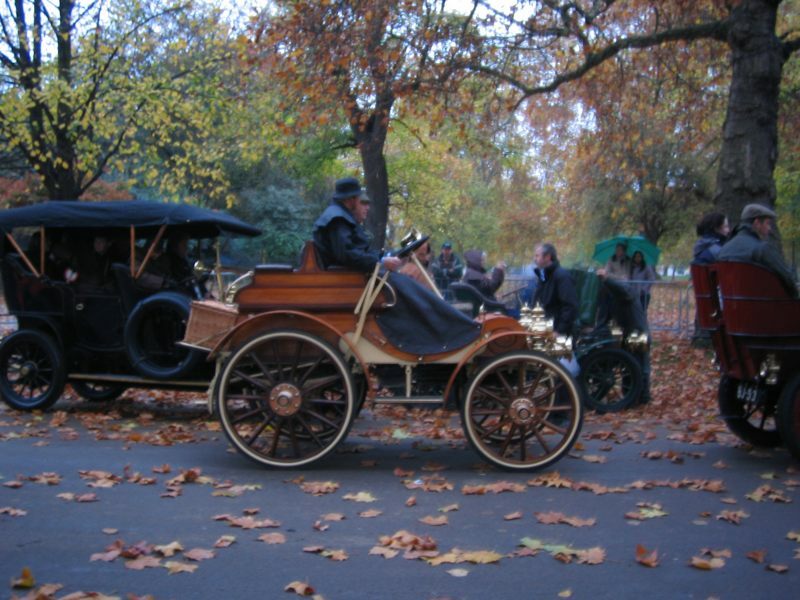 Went along to the start of the London To Brighton Veteran Car Run in Hyde Park. An early start, got up at 6am and was in the park around 7am. Weather was damp and drizzly and the light was poor which meant the pictures I got were crap, not helped by being under trees, so only two pics posted here. These cars are quite amazing, they are all PRE 1905!!! 100 years old and more!!! 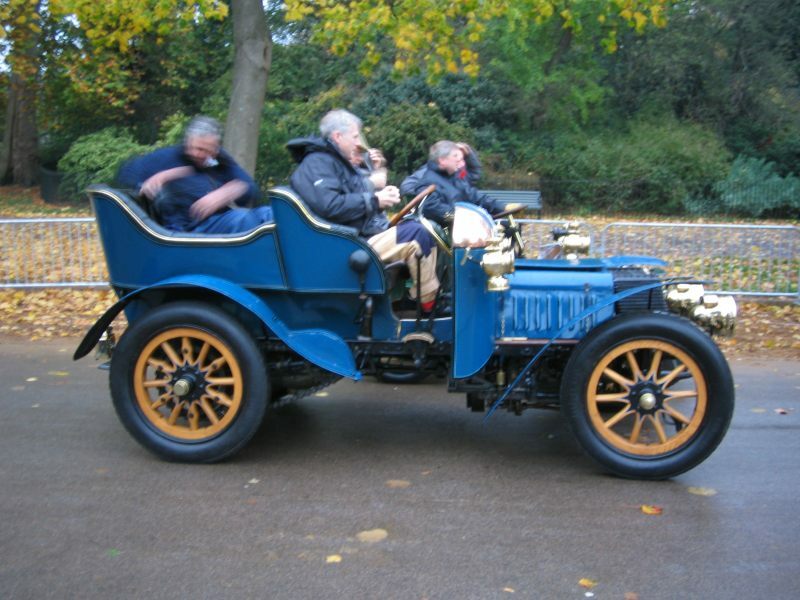 I was pleased to see Genevieve, a 1904 Darracq, made famous by the (very good) film of the same name, from 1953. I was disappointed not to get a good picture of her though (not posted here)! A good atmosphere about the place, quite a few posh people around. The guy doing the commentary on the PA, sounded like a Harry Enfield character! The run to Brighton is 60 miles. Great to see these cars getting used (in the rain) and not sitting pampered in a museum all the time. Dannii Minogue and Mr Al Fayed in the lights somewhere! 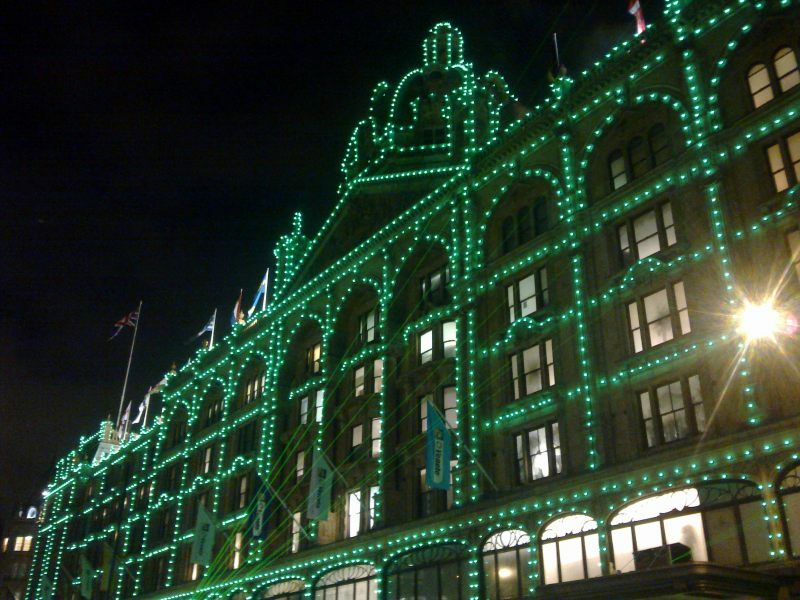 Harrods switched on their Christmas lights today. Dannii Minogue and the Boss, Mr Al Fayed were there for the ceremony. Also joining them was ten year old Dominic, a patient of Great Ormond Street Hospital. Harrods are helping the charity. 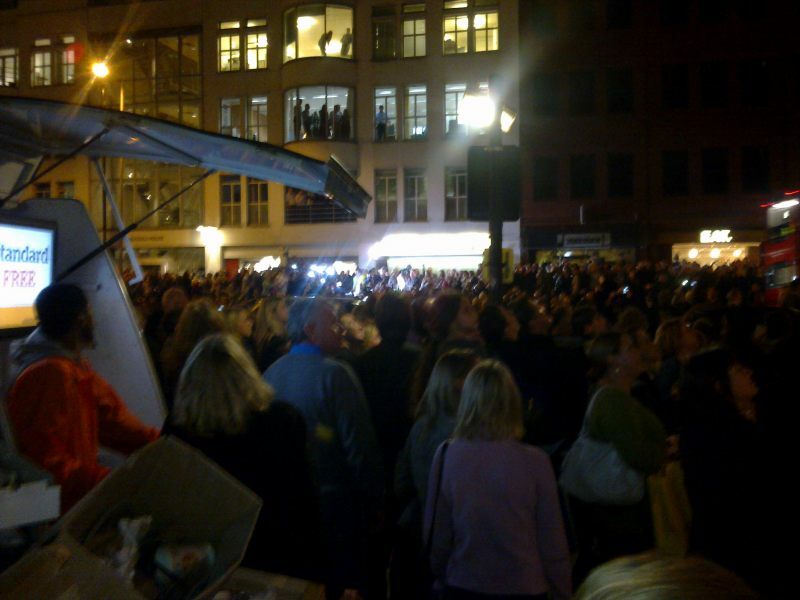 There was quite a crowd there. Busier than I thought it would be. The scene in the picture is across the road from the store, from there you can see the whole front of the building lit up. Of course there was the obligatory countdown and applause when they switched them on. Quite good fun actually! 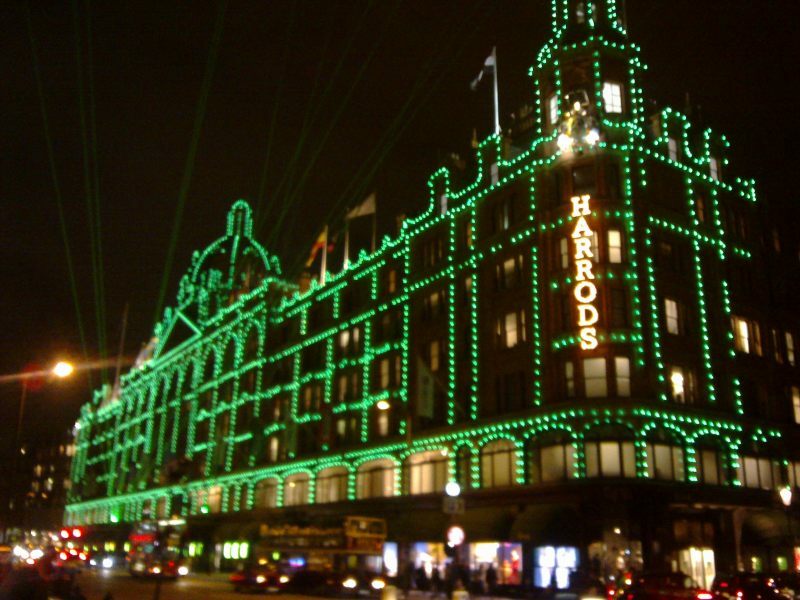 Harrods are having a Wizard of Oz theme this Christmas, hence the green lights for the Emerald Palace of Knightsbridge! The lasers on front of the building were amazing! I walked all the way down Brompton Road, past the Victoria and Albert museum, the lasers were still lighting up the sky above!